That's right, folks! [common ground] is celebrating this first Thursday in February with the theme "Multitudes of Expression"-because there are many, many ways and means to love one another. Come join us for a night of amazing talent! Doors open at 6! Open mic sign-ups END at 6:30! $5 suggested donation, but no one turned down if you don't got funds. Love and laughter guaranteed. See you there! 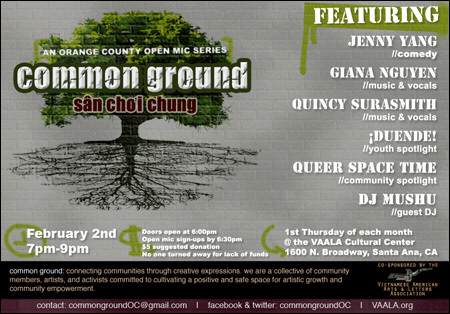 [common ground] connects communities through creative expressions. We are a collective of community members, artists, and activists committed to cultivating positive and safe space for artistic growth and community empowerment. More information found here, or on the common ground blog.